Norse, yes; but is it Viking or Norman? The Y-DNA SNP mutation called YP4248, found among the descendants of the CF01 Group of the Cooley DNA Project, is shared with several surnames, including Cooley, Hackett, Whitfield, Cochran, Cummings and Storry. YFull.com estimates that the marker came into being along with the birth of a man about 1,450 years ago, say the 5th century C.E. We don't need to go far up the SNP tree to find Scandinavian testers listed as descendants. Indeed, this branch, one of many of a much larger tree, descends from the mutation L448, which is nicknamed "Young Scandinavian." Age estimates are just that. Despite the sophisticated algorithms used among population geneticists, ages can be judged only by the intersections of SNPs with testers and will alter every time a new Y-DNA sample comes along. The fifth century for the birth of our guy isn't set in stone. But if we're on the mark, he was born too early to be part of the Viking incursions into the British Isles, although we can't rule out the likelihood of earlier traffic across the North Sea. 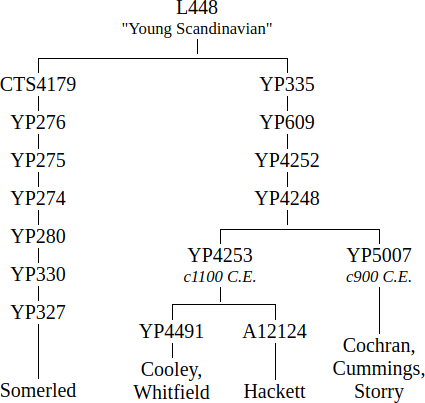 YP4248 has two known subclades, YP4253,1 from which the Cooleys, Hacketts, and Whitfields descend, and YP5007, which represents a man who preceded the Cochran, Storry, and Cummings families, all three of which might have had Norman origins: Robert of Comyn was elevated to Earl of Northumberland by William the Conqueror, and some researchers believe the ancient Barons Cochran of Renfrewshire were Norman. There's also a Norman tradition (as well as Viking) attached to the Storry family. Can it be that the Cooleys, Hacketts, and Whitfields were poor relations to their apparent nobler cousins? Still, notice that YP4253 is estimated to have had a slightly more recent descent. It's possible the lines immigrated separately and share a common ancestor outside of Britain. Somerled's ancestor (CTS4179) separated from the lineage in question about 2500 years ago. Likely, however, they both emerged out of the Bergen area, and the descendants might have been associated with one another for centuries. But that's nothing on which to hang our hats. Still, I felt some encouragement while reading Viking DNA: The Wirral and West Lancashire Project. Listed among the DNA and surnames studied by the authors are Colley (of the Wirral Peninsula) and Coly (of West Lancashire).2 The name Cooley has multiple sources; both of these are rare variants. Apart from its known Viking history and the presence of YP4253, there are historical reasons to look at this region of England. Two stories were handed down separate lines from John Cooley. A descendant of James Armstrong Cooley (c1831-), a grandson of John's son Edward, claims that a piece of tartan was passed down from the immigrant and buried with its last possessor in the 1970s. The ancestor, the story goes, was transported to America as a prisoner after the failure of the Jacobite uprising, his elder brothers having been executed. Another story, known by the descendants of Edmond Cooley, likely another son of John's, tells us that the Cooley ancestor was "involved in a fight in Scotland," killed "some high ranking people," and fled to America. Neither of these stories can be verified. However, it's worth noting that Bonnie Prince Charlie — acting on behalf of his father, the claimant to the Stuart throne, and after acquiring about three hundred fresh recruits at Manchester — halted his advance on London in 1745 at Derby (pronounced Darby by the British, by the way). On advice of his council, he marched his forces north and was defeated at Culloden Moor on April 16, 1746 by "Butcher" Cumberland, the son of King George II. The victorious Duke marched north into the Highlands and slaughtered rebels and non-combatants alike, imprisoned wives and children, hanged more than a hundred accused Jacobites, and sent hundreds to London for trial, after which they were either executed or transported to the colonies. If we're right about his birth year, John Cooley would not have been ten, but we can imagine his family might have been caught up in the events at the time. I can find no record for John Cooley in Derbyshire, but there is a record for John Cowley, son of William, christened on May 29, 1738. He had two sisters who married and raised families nearby. But no subsequent mention of John, his father, and an apparent cousin, another William Cowley, are found. But I'll abandon that speculation here. This is circumstantial evidence, but these bits of history and genetics appear to place John's family in what was formerly Viking territory. Perhaps the YP5007 families had Norman heritage, but I think not YP4253. Targeted DNA tests in the northwest of England might one day reveal living descendants of this SNP and even of the more recent YP4491, which presently defines CF01 and the Cooley/Whitfield family. On the other hand, John's ancestors could have crossed the Isles any number of times over the preceding 600 years or so. We may have about as much chance in finding John's birth place and immediate forebears as we have in digging up the ancestral boots that first stepped off a Viking boat onto British soil a millenia or more ago. 1 "Known" because testers with previously unknown mutations will undoubtedly test. 2 Steven Harding, Mark Jobling, and Turi King, Viking DNA: The Wirral and West Lancashire Project, Boca Raton: CRC Press, 2010; pp. 95-96, 100. 3 I wrote a paper in 2011 about the influence Culloden Moor would have had on the American Revolution.